Computer power on paper. 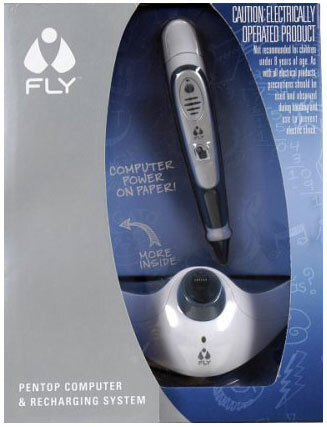 The Fly pen-top computer's power comes from an optical scanner that sees everything you scan and write on special dot matrix paper. The pen computer has a built-in computer processor and a voice. If you have a math problem, the pen top computer can solve it. You can schedule anything and Fly pentop computer will remind you. You can draw drums and keyboards and record your own tunes. Play games with your friends-anywhere, any time. Plus, you can load Fly pentop computer with Flyware cartridges to add new games and adventures.